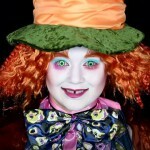 Our latest challenge to PinkStylist was to re-create Johnny Depp’s Mad Hatter makeup from Tim Burton’s Alice in Wonderland. Using this Mad Hatter costume and wig (which he also used to create some of his own Mad Hatter eyebrows), Charlie has once again delivered with a stunning look. We especially love the DIY thread spool bandolier he created. 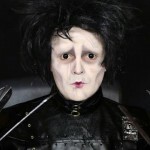 Click here to check out the other makeup looks that Charlie has based around our costumes, if you haven’t already. 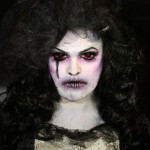 You can also check out a more gender-bending interpretation of this makeup look created by Kat Sketch in our blog post. To see more of Charlie’s work, check out his YouTube channel and follow his pages on Facebook, Twitter, and Instagram. 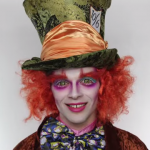 This tutorial is meant to be for the character Mad Hatter from Tim Burton’s version of Alice in Wonderland. Aside from Edward Scissorhands, this is probably one of my most favorite Johnny Depp characters because it’s just the most fun, colorful, corky character ever. I think it’s brilliant. Some of you guys out there who have been subscribed to me for quite a few years might realize I’ve done this makeup tutorial before. Now as I’ve said before I’m not usually in the habit of recreating makeups I’ve done before, but this one I did about three to four years ago and it was when I had not-as-good of camera quality, and the lighting wasn’t as good. So, I thought I would revisit this makeup, using different products and techniques I’ve picked up over the years, so I hope that’s ok. I definitely think I’ve improved on the makeup itself since the last time I did it, but I’ll leave that up to you guys. If you guys want to see more recreations of the older makeups that I’ve done with the better camera and lighting, audio just let me know and I’ll revisit them. If you’d like to learn how to recreate this makeup stay tuned. The first thing I’m going to do is put on my foundation, so I’m going to take a Snazaroo Clown White and apply that really loosely underneath my eyes and down the middle of my face. I can then blend that out with a kabuki brush. This stuff does blend a really long way. I’m also going to apply that on my neck and ears. Then to set everything and get rid of any hint of color I’m going to take a Ben Nye Setting Powder in Super White, and I’m going to press that really heavily all over my face and brush off the excess. Then I’m going to take my Sugarpill Pro Palette, and I’m going to use the Dollipop color from that which is the bright pink. I’m just going to do that underneath my eye and smoke it out. Just try not to go too far beyond the socket line. Think of it as a bruise, but a more fabulous version of a bruise. Then I’m going to take the purple color from this palette, which is “2AM,” and I’m going to apply that really lightly, just in the corner of the eye where the bruise would be the darkest point. So, it’s just right underneath the corner of the eye and then tapered out. It kind of extenuates the socket a little bit. So, nothing major, just a little bit of subtle bruising in there. Then I’m going to do exactly the same on this side. Instead of the pink I’m going to use the red from the Pro Palette which is “Love+.” I’m still going to use the purple though as the bruising. Then on the red eye I’m going to take the “Afterparty” color from the Pro Palette, and I’m going to use that and apply it all over my eyelid right up to my eyebrow. Then the same on this eye except I’m going to use the 2AM color from the Pro Palette. Then taking the Pink Dollipop again I’m just going to sweep it down the sides of the nose just to do a tiny bit of contouring there. I really love this makeup – most of the contouring is done with the Pink Eyeshadow, which is really fun. Then taking the pink again I’m going to do the classic Johnny Depp cheekbones. So, he’s got the really masculine straight line going across and then down. So I’m just going to do that harshly, and then I can blend that color outwards leaving the cheekbone area completely clear. 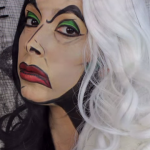 So super, super, super contoured. So then I’m going to do exactly the same using the same color, and I’m just going to do a half moon shape by the side of my temples and blend that color outwards. Then, taking a White Mascara by Stargazer, I’m going to put that really, really heavily to my top and bottom set of lashes. So when I say “heavily” I mean quite heavily, because the bottom lashes look very spidery, very twiggy like. Then, the super fun part: the eyebrows, which is why I have not blocked my eyebrows out for this makeup (which makes it a first I think). I am actually applying some fake hair over my eyebrows, so there’s no need to block them out. The hair I’m going to be using is the same hair that is used for the wig, which is from the costume I’m going to be using, which I got from BuyCostumes.com. I’ll take a few clippings from that wig just so it matches the hair. So I have got myself some eyebrow hair. So I’ll need to brush through that, but I’m going to do that while the spirit gum is drying. 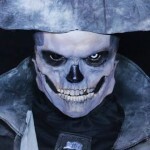 I’m going to take some Mehron Spirit Gum and I’m going to apply that over my eyebrows just really lightly just to get a base coat going. Once the Spirit Gum is dried, I’m going to apply one more layer of Spirit Gum just one eyebrow at a time, and then I can press the hair down over the top of it. Doesn’t matter the length for now, cause I’m going to shape that afterwards with some scissors and such. The idea is to get the hair like that so it’s a straight edge and I’m going to apply it outside and then inwards and then brush it and style it afterwards. Then as its drying I’m just going to pull it to one side ever so slightly so that it sweeps across. Then being super, super, super careful (if you don’t trust yourself, just cut them before you apply them, but I just like doing them now just so I can see exactly how long I want them to be) I’m just going to cut the excess off. Then I’m just going to stagger it a little bit by cutting into it little tiny chunks at a time. I want it to be really feathered. Then taking a tiny bit more Spirit Gum I’m going to apply it just to the edge of my eyebrow and then taking one long piece I’m going to stick that down on top and then thin it out by pulling it outwards. Then before I do any kind of styling to it I’m going to take my Makeup Forever Flash Palette and I’m going to use the Orange from this palette which is like a really nice thick crème. Going to use it to go underneath my eyebrow and then sweep the color up just to make it look a little bit thicker. Then take some hairspray, some really strong hairspray. I use Tresemme Freeze Hold, this stuff is incredibly strong. So I’m going to spray it on the back of my hand really lightly so I got the wetness of it, and I’m just going to take my finger and brush it over so that I can style this. It’s just a lot lighter than using a wax or anything. Plus it saves me from having to spray hairspray close to my eye which can’t be good for you. I’m just going to dab that at the ends and start pulling in the shape that I want. Imagine Poison Ivy from the Batman movie. You just pull this side outwards, but this sprig needs to stays up. Then I just need to replicate this on the other eyebrow. For the lips I’m going to use a pinky, purple color by Revlon. This is a 625 Iced Amethyst, you can actually see that there. It’s a really lovely color, it’s like a really nice purple. So nothing major with it, just regular lips shape, nothing too full. Then I’m going to work on the teeth so I’m going to do this off camera cause I’m not a massive fan of my teeth and getting close on camera so yeah forgive me for that. But I’m going to take a Kryolan Black Tooth Enamel which is probably one of the best tooth enamels I’ve used so far. It’s really the thickest, so the idea is to dry the area of your tooth, and then you just wipe the color across once, let it dry, and maybe two to three coats in between, let it dry, and you’re set. To remove it, usually fizzy drinks do the trick. You could also just obviously just brush your teeth and it’s gone. The idea is to go once down the middle of my teeth just to give it a nice little gap that he’s got. There we go! So then all that’s left for me to do is pop on my contact lenses, my costume and I’m done. And there we go that’s the look complete. So I finished the look off by popping on a beautiful costume which I got from BuyCostumes.com. I added this little spool-like ammo sash that I made a while ago from when I first did this tutorial. I just made it just by stringing together some different colored spools in colored order. Just adds a little bit of character to the costume. I popped in a pair of contact lenses from Camoeyes.com. They’re really cool yellowy lenses that fade out to green I really hope you guys enjoyed this makeup.